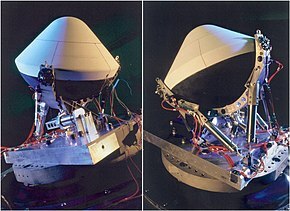 Deep Space 2 was a NASA probe part of the New Millennium Program. It included two highly advanced miniature space probes that were sent to Mars aboard the Mars Polar Lander in January 1999. The probes were named "Scott" and "Amundsen", in honor of Robert Falcon Scott and Roald Amundsen, the first explorers to reach the Earth's South Pole. Intended to be the first spacecraft to penetrate below the surface of another planet, after entering the Mars atmosphere DS2 was to detach from the Mars Polar Lander mother ship and plummet to the surface using only an aeroshell impactor, with no parachute. The mission was declared a failure on March 13, 2000, after all attempts to reestablish communications following the descent went unanswered. Deep Space 2, also known as "Mars Microprobe," was the second spacecraft developed under the NASA New Millennium Program to flight-test advanced technologies concepts for space missions. The purpose of the program was to do high-risk technology demonstration, with a motto "Taking risks to reduce future danger." Each probe weighed 2.4 kg (5.3 lb) and was encased in a protective aeroshell. They rode to Mars aboard another spacecraft, the Mars Polar Lander. Upon arrival near the south polar region of Mars on December 3, 1999, the basketball-sized shells were released from the main spacecraft, plummeting through the atmosphere and hitting the planet's surface at over 179 m/s (590 ft/s). On impact, each shell was designed to shatter, and its grapefruit-sized probe was to punch through the soil and separate into two parts. The lower part, called the forebody, was designed to penetrate as far as 0.6 meters (2 ft 0 in) into the soil. The upper part of the probe, or aftbody, was designed to remain on the surface in order to radio data to the Mars Global Surveyor spacecraft in orbit around Mars. 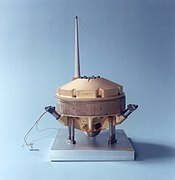 The Mars Global Surveyor would act as a relay in order to send the data collected back to Earth. 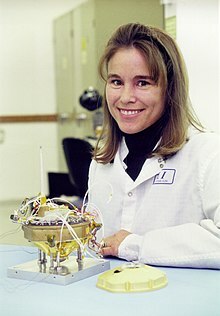 The two sections of the probe were designed to remain connected via a data cable. The probes reached Mars along with the Mars Polar Lander mission, apparently without incident, but communication was never established after impact. It is not known what the cause of failure was. The probe radio equipment had a low chance of surviving the impact. The batteries may have failed on impact. The probes may have bounced on impact. The probes may have landed on their sides, resulting in bad antenna performance or radio link geometry. The probes may simply have hit ground that was too rocky for survival. The board concluded that the probes and their components were not tested adequately before launch. ^ a b c Davis, Phil; Munsell, Kirk (January 23, 2009). "Missions to Mars: Deep Space 2 - Key Dates". Solar System Exploration. NASA. Retrieved July 8, 2009. ^ a b c "Deep Space 2 (DEEPSP2)". NSSDC Master Catalog. NASA - National Space Science Data Center. 2000. Retrieved July 8, 2009. ^ Nola Taylor Redd, "NASA's New Millennium Program: Taking Risks to Reduce Future Danger", Space.com. Retrieved 6 March 2019. ^ Gavit, S. A., and Powell, G. (1996). 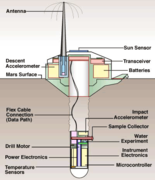 "The New Millennium Program's Mars Microprobe Mission", Acta Astronautica, Vol. 39, No. 1-4, pp. 273-280. ^ Smrekar, S., et al. (Nov. 1999). "Deep Space 2: The Mars Microprobe Mission," J. Geophys. Res., Vol. 104, No. E11, pp. 27013-27030. ^ a b "Report on the Loss of the Mars Polar Lander and Deep Space 2 Missions" (PDF). Jet Propulsion Laboratory. 22 March 2000. ^ a b Young, Thomas (March 14, 2000). "Mars Program Independent Assessment Team Summary Report". Draft #7 3/13/00. House Science and Technology Committee. Retrieved April 22, 2009. 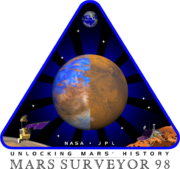 "Press Kit: 1998 Mars Missions" (.PDF) (Press release). National Aeronautics and Space Administration. December 8, 1998. Retrieved April 22, 2009. Wikimedia Commons has media related to Deep Space 2.